Kansas GOP Insider (wannabe): Guess who isn't coming to dinner? 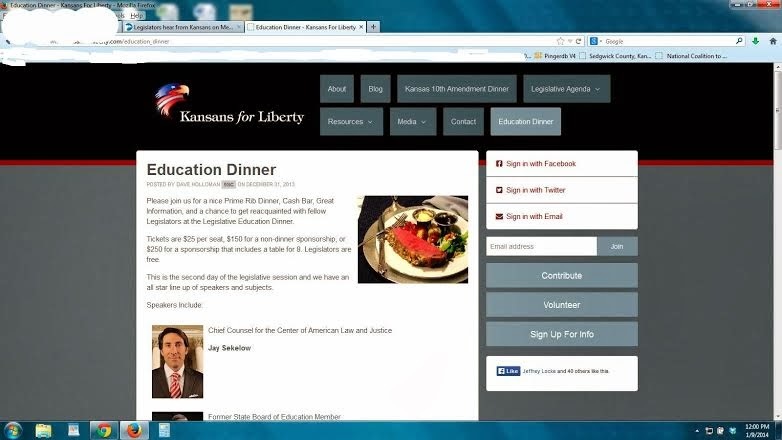 Kansans for Liberty is throwing a fundraising dinner in Topeka on Jan. 14. As recently as Dec. 31, the group's website advertised that Jay Sekulow, of the American Center for Law & Justice, would be a special guest speaker at the event. "If someone is going to use a big name to up their ticket sales, maybe he shouldn't choose someone who sues people for ethics for a living." For what it's worth, Sekulow's name no longer appears on the website. The speakers now include Walt Chappel, a former Kansas Board of Education member; Kristin George, the co-founder of Kansans Against Common Core; and state Rep. John Bradford. I had never heard of this group before receiving an anonymous email, but according to their website their mission is to build a positive working relationship and dialogue between the grassroots movement in Kansas and state legislators, and to work for legislation that is moral, constitutional and protects the sovereignty of state and individual. Humm, there is something amiss, for sure. I will still attend the meeting. I was excited about a national figure as featured speaker. Hopefully the 3 speakers will say. I will be with KEFM, Kansas Education Freedom Movement and passing out brochures. Bottom line: putting out bogus information is not the way to win anything, Republican or Democrat. We have not so many economic problems as we do a fundamental moral decline at all levels of society.